A guided walking tour is the perfect introduction to downtown Savannah. The historic district is small and cozy enough that you can cover its main attractions while exploring by foot—plus better appreciate its beautiful architecture, riverfront location, and good weather (almost year-round). 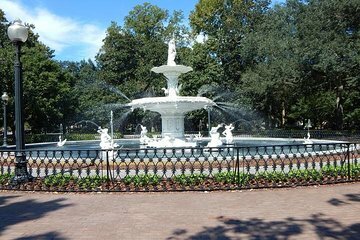 Stops along the way including the City Market, Broughton Street, and the well-known Forsyth Park Fountain. Martin provided a very good tour, taking us through the history of Savannah and providing a lot of useful information. The two hours we spent together were interesting since he covered a great breath of topics. Our only issue was that we found he didn't focus on architecture as much as we would have liked.